Ferns grow abundantly in Aotearoa New Zealand, and the silver fern (ponga) has become one of our most recognisable national symbols, with both leaf and frond used widely in art and branding. 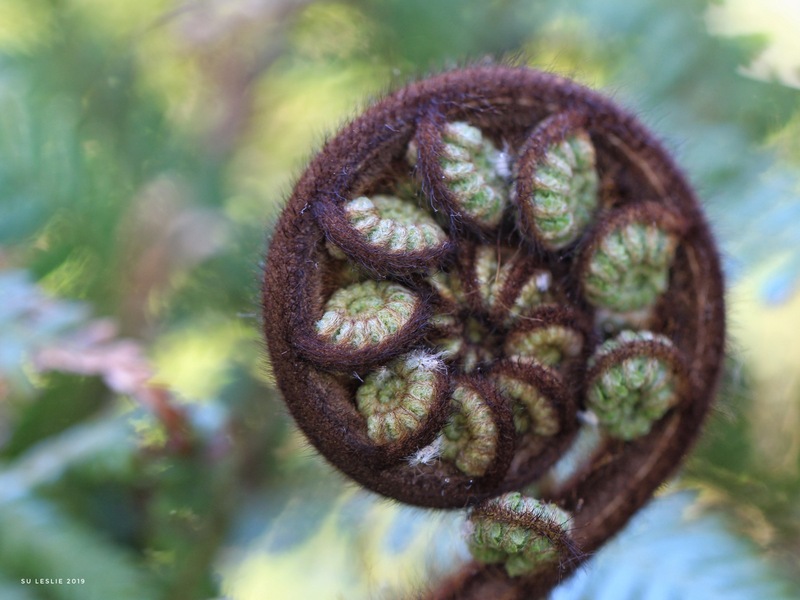 The koru (literally loop in Maori), or unfurled frond, is highly symbolic to Maori. It is frequently depicted across all Maori visual arts (something already mentioned by Ann-Christine in her ‘Curve’ post), and symbolises growth and the continuation of life as well as strength, endurance and power. Can you eat them Su? The ferns are frequently eaten here where they are at that stage. I believe so, though I haven’t tried them. They eat them here…but I haven’t so far…. That is so simple and so perfect Su! Thanks Tina. Nature certainly sets the benchmark for beauty. Exquisite curves. This is so fascinating. A sad time. I hope that being with whanau and sharing memories helps you all. Kia Kaha. And btw: the Koro Lounge isn’t a patch on what it used to be — though Christchurch is better than Auckland International. Good eye! Great capture, Su! You can eat some of our ferns, but not others. I have trouble telling them apart, so I don’t eat anything I’m not sure is edible. People get poisoned that way. Oh this is so beautiful. It inspires a piece of jewelry, maybe a broach, made with tiny seed beads and yarn!!!! Wouldn’t it be beautiful if you could copy the natural beauty you captured? Beautiful – so beautiful. My Koru is a Swedish one, but this is the real thing. This is such a simple and perfect example of curves–thanks to Mother Nature! Lovely idea, Sue. Nature does so many things better than us. If only we paid more attention and tried to live in nature rather than wanting to dominate (and destroy). Just gorgeous Su! I loved taking shots of these when we were in NZ. Nature is amazing. Glad you like them. Nature IS amazing. Thank you so much. I’ve been reading a bit about ferns lately; such an old life-form — and so fascinating.